The summer ninja series has come to a close. We now return to our regular pre-May programming with a Your Stupid Minds mainstay: a movie with a basketball player! Dennis Rodman stars in arguably the worst of his two action movie vehicles: Simon Sez. Fresh off the heels of Double Team starring Jean-Claude Van Damme and Mickey Rourke, Rodman returns to (or remains in) France to make this action spy comedy. 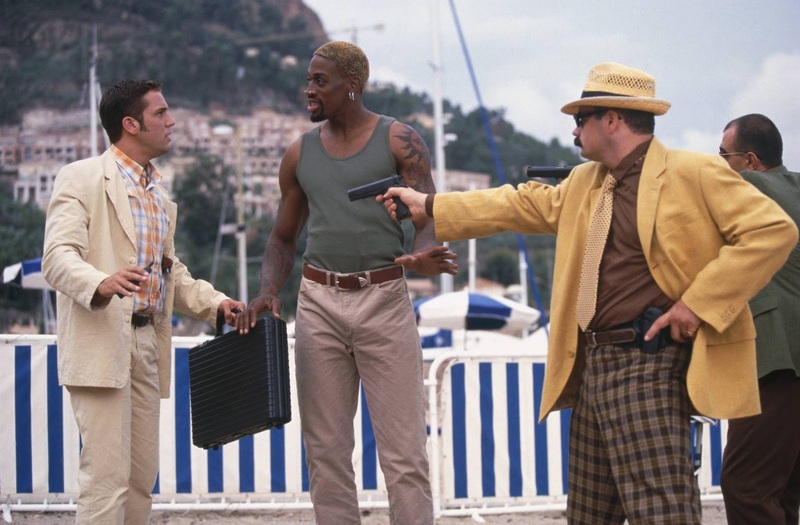 Simon (Rodman) is a freelance Interpol agent working to uncover a mysterious arms deal with his monk-attired partners Micro (John Pinette) and Macro (Ricky Harris). Later, Nick Miranda (played by an insufferable Dane Cook) asks Simon to help him with a kidnapping exchange. Their two missions intersect and the spy group must stop the vamping bad guy from blowing up the Eiffel Tower. David Robinson was never a spy but he was honorably discharged from the Navy for being too tall. Karl Malone makes a nonexistent appearance as Dennis Rodman's bocce opponent. IMDb claims that "Robert Downey Jr. was replaced with Dane Cook because Downey dropped out and they needed someone within a few days." I have no other source to verify this. Technically, Hulk Hogan would be okay with Dennis Rodman dating his daughter, so he has no excuse to not be in this movie.